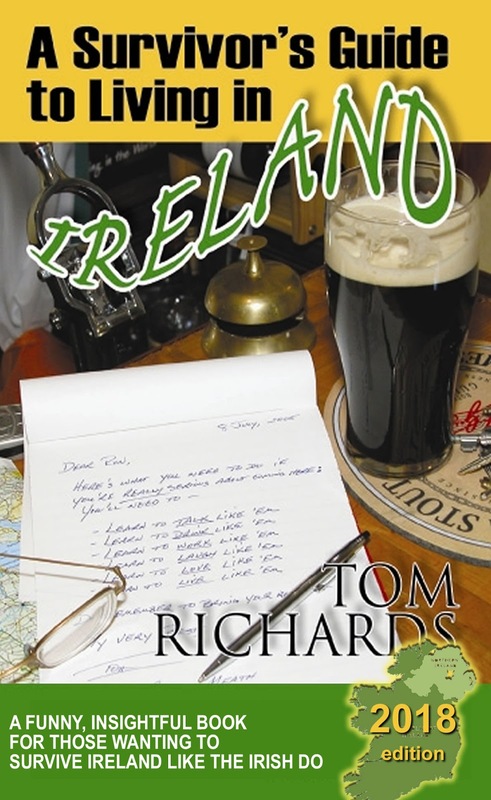 A Survivor’s Guide to Living in Ireland 2018 Edition lets you follow in the steps of Tom Richards, an ex-pat who has lived in Ireland for over 35 years. Come for a week – stay for a lifetime! That’s the lure of Ireland. Essential reading for anyone considering a move or visit to Ireland. 6th edition! Over 14,000 copies already sold! Will the continuing political melees of Brexit and Trumpism affect your plans to move and work in Ireland? Are you entitled to an Irish Work Visa? If so how can you get one? Is Ireland the land of your dreams? Have you ever thought of staying for a prolonged visit, establishing residency, or creating an Irish business? Have you ever wondered what it would be like to live in Ireland? Find out in this rich volume of almost 90,000 words devoted to the ever-changing tapestry of living and working in Ireland. This fun, easy to read book contains (among other things) a brief history of Ireland, the opportunities present here for would-be immigrants, and tips on how to get a work permit, become a citizen, buy a home, cope with taxation and the cost of living, and enjoy this amazing country for yourself. As an added bonus, a Dictionary of Irish Slang and Phrases is also included! 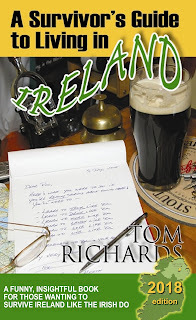 In 1982, American Tom Richards, fresh out of UCLA, took a four-week holiday in Ireland. He’s been here ever since. Witty and insightful, Tom tells how he overcame the culture shock of living in the Ol’ Sod, learning to twist his middle-class American thinking into a more European point of view while managing to pay his bills at the same time. Along the way, he’s learned some practical lessons that he now shares: From how to understand the Irish to how to drink a perfect pint; from finding a job to how to get a work permit; from purchasing your fist dream home to learning to take soaking walks on a soft Irish day. Here, he reveals that to survive in Ireland all you have to do is discover the magic of this wonderful country for yourself. A Survivor’s Guide to Living in Ireland has already sold over 14,000 copies. With it you can learn to Talk like the Irish, Drink like the Irish, Work like the Irish, and Live like the Irish. Essential reading for anyone considering a visit or move to this fabulous country. If you're thinking of living and working in Ireland; if you think you're entitled to citizenship or a visa to move here; if you're considering a visit and want the low-down on how to best enjoy the Irish and their staggeringly beautiful country, this book is for you. Buy A Survivor's Guide to Living in Ireland 2018 Edition now. Click to find out more.